Most girls want to have the best gown before walking down the aisle for their wedding event that's why they spend large amounts of money for that single but special day. Considering the best thing that highlights the peak of the moment to most women in their life, it is worth commemorating. One of the most beautiful actress in the industry and was married to Senator Chiz Escudero. Wearing an ethereal Ezra Santos during her wedding day, she impressed a lot of people with her Queen-like visage which is a gown inspired by Gracy Kelly, Princes of Monaco. In her interview, she told that she was a huge fan of the Princess that's why she got easily clicked with the modern design of the gown. Solenn Heusaff married his longtime boyfriend, Nico Bolzico who is an Argentinian Businessman. Their wedding is a French-themed event where Solenn wore a gorgeous long wedding dress weaving with fine classy designs. Israeli designer Lihi Hod made the gown. They got married first with a civil wedding then after a while went to their official church wedding. Her wedding with Dingdong Dantes was the most talk event in the entire Philippine showbiz career. The wedding gown of Marian Rivera costs 2 million pesos made by a Filipino designer Michael Cinco based in Dubai. The very classy Spanish-themed wedding event took place at the Cathedral of Immaculate Conception in Quezon City last 2014. Paul Jake Castillo, a businessman, and a former PBB housemate married Kaye Abad last year. Their wedding ceremony was held in their hometown in Cebu City. She was wearing an off-shoulder wedding gown that is embroidered with elaborate designs. The gown was custom-made by a famous fashion designer, Francis Libiran. Toni Gonzaga was happily married to the film director, Paul Soriano. They were married on the exact day of their 8th year anniversary as a couple. Toni wore a wedding gown which is a fine piece of work made by Vera Wang. A lot of her fans got happy with their wedding and got delighted on seeing her in the wedding dress. At the age of 30, Georgina Wilson finally settled down and married a British businessman, Arthur Burnand. Georgina is a renowned model, product endorser, and actress. She looks astonishing with her Monique Lhuillier embellished gown from the Fall 2015 collection gowns. She looks regal and classy in those stunning photos that are complemented by the archaic background. They are perfect for each other. Although Bianca wanted to have a simple wedding gown, she looks elegant and vibrant with her surreal gown. She picked personally the gown she wore and matched it with a floral crown that is perfect for their beach themed wedding. The wedding dress was a "Ubeda from the Soft" by Rosa Clará collection. 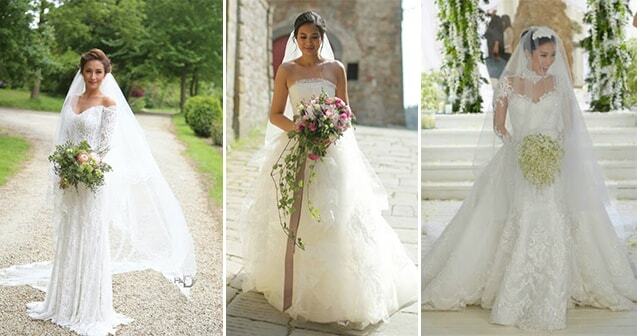 Isabelle Daza also wore a wedding gown made by Vera Wang. She was married to a French businessman, Adrien Semblat, in Italy. Her wedding dress is a strapless gown with a lavender ribbon on her waist which is embroidered with a very fine lace designs. Daza is the very first Manila bride that Vera Wang worked with according to the photographer Pat Dy's Instagram post. wore a light makeup which made her look so captivating. Tv host and song artist Karylle married Yael Yuzon, lead vocalist of Spongecola, last 2014. Karylle's wedding gown was made by the fashion designer, Furne One who was based in Dubai. It was made with very intricate designs and embroidered with fine laces. Vicki Belo married her Hayden Kho Jr in a star-studded luxurious event in Paris. Vicki wore a unique gown which is made by Michael Cinco which is a Dubai-based designer. It is a very luxurious wedding gown with a 3-meter long train made of French weaves and fully embroidered baroque pattern with transparent and rose opal Swarovski crystals. Anne Curtis, Actress and TV host, and Erwan Heussaff, businessman and blogger, finally got married in a private wedding in Queenstown, New Zealand. She showcased her blooming long-sleeved lace gown which designed by a Filipino fashion designer Monique Lhuillier. Anne matched the gown with a pair of velvet Prada boots instead of using high heels upon walking the wedding aisle. What are your thoughts? Aren't these gowns look fabulous with these celebrities? Share this article!